For better or worse, the advent of smartphones and tablets mean that we’re rapidly moving away from the more tactile user experiences that were the hallmark of a bygone era in computing. As it turns out, the folks at Fujitsu are eager to close the book on the days of the physical keyboard if what they were showing off here at MWC was any indication. Tucked away in a corner of Fujitsu’s booth here in Barcelona’s Fira Gran Via was a gentleman typing out words onto a tablet via a keyboard for anyone who would watch him. It sounds like a completely mundane occurrence, except the keyboard he was typing on wasn’t actually there. 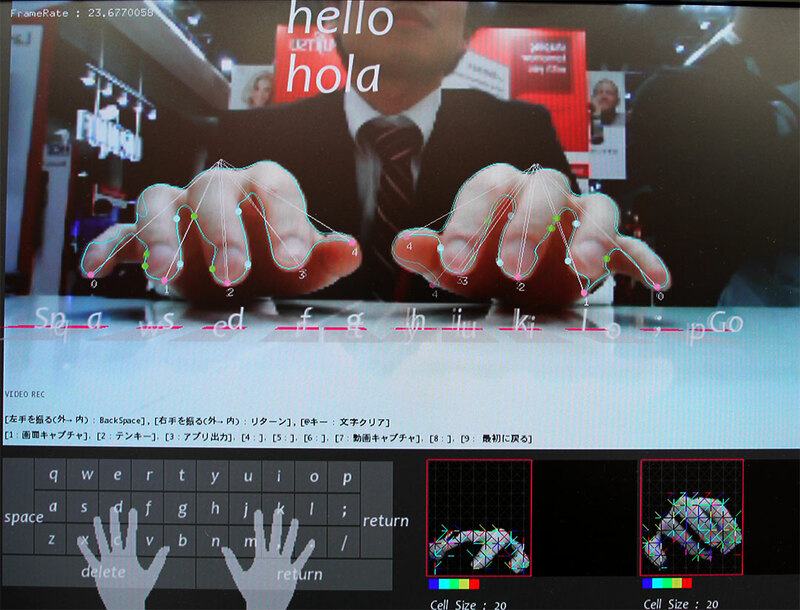 Here’s the idea: thanks to some clever software and the front-facing camera on a tablet, Fujitsu has worked up a way for users to type on just about any flat surface. The software is purely a prototype at this point, but it doesn’t need anything in the way of exotic gadgetry to work properly — it appeared to be running just fine on a generic Fujitsu Windows 8 tablet, albeit with a lamp of sorts to keep the user’s hands nice and bright. Using the gesture keyboard seems so simple when you’re watching it live — a person calmly tapping on the surface of a table is actually typing out sentences — but the underlying tech is nothing to sneeze at. There’s some serious machine learning going on here, as the system gets a feel for the features and movements of a user’s hands to determine their placement on a keyboard that really isn’t there. Sadly, that means there’s a fair amount of optimization that needs to happen before someone could actually start using it. The Japanese gentleman pecking out missives on top of a table was kind enough to let me try it anyway, and while the camera clearly noticed my hand it wouldn’t track any of my finger inputs. Apparently, the software is capable of using skin color to figure who it should actually be accepting input from — at that moment the system was setup to only track his alabaster hands, so my brown mitts were promptly ignored. Certainly a bummer for me, but a still useful feature, especially since one can never tell how many alien hands they’ll encounter as they try to get some work done on the go. Fujitsu is considering turning this into a working product for inclusion on some of its tablets and smartphones and has been at it for a while now — company researchers published a paper on the concept back in 2011. Still, the gesture keyboard strikes me as one of those things that may be too clever for its own good in that it’s a very neat solution to a problem that doesn’t really exist. Trying to get some work done on a tray table on a plane? There’s plenty of room for a physical keyboard. Stuck slaving away in close quarters? Just pound out some text on the touchscreen. The gesture keyboard is clearly very cool (it hearkens back to those neat laser keyboards) and I’d certainly love to a take it for a long-term spin, but I doubt that Fujitsu’s keyboard-less keyboard approach is one that will take the world by storm — for now. Its value as a standalone typing solution is questionable, but if Fujitsu baked it into a tablet or a phone as a novel alternative? Or better yet, if Fujitsu found some willing, ambitious OEM to license it to? Sign me up.